I love the NHS. For me it’s been the place where life starts as our four children were all born in the local NHS hospital, it’s where life is extended as it gave us all extra time with my mum before she eventually lost her fight with cancer and it’s where the quality of life is improved as the NHS repaired my knee and got me playing tennis and football again. It’s an institution that I am passionate about, that I am grateful for and that I am immensely proud of. 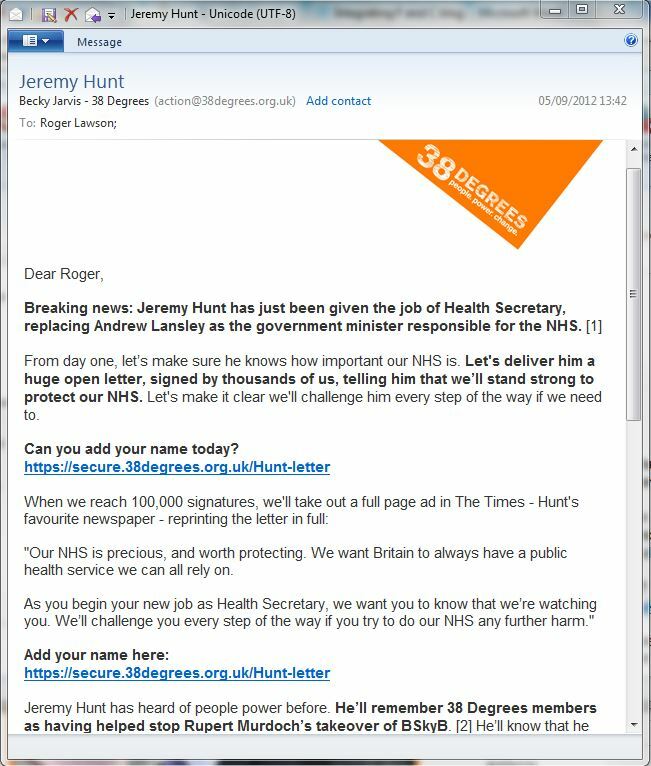 So when Jeremy Hunt, who happens to be my local MP, was given the role of Health Secretary last year, I was worried. Of course the NHS isn’t perfect, but I don’t agree that parts of it would work better under private ownership and I don’t want to see him, or any government, selling it off. Will you tell Jeremy Hunt that we’re watching him? So far, so good. I felt better (I’d done something) and I wasn’t on my own. But it’s what followed that I think was brilliant. 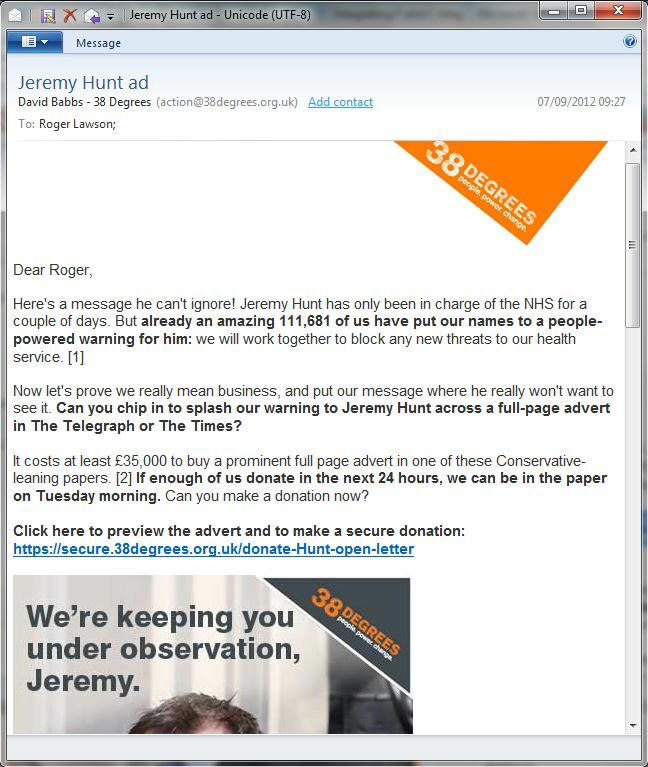 38 Degrees is a campaigning organisation, but if asking for donations sits slightly uncomfortably it doesn’t show. With great timing, they followed up with a donation ask. Will you help pay for an advert that Hunt can’t miss? And four days later, my ad was in the paper. How great did I feel? It’s a great story which I share because it’s a great example of how campaigning and fundraising can work together. For all the lessons we can take, I think the most important thing they got right was the ask. They didn’t just assume that because I take part in campaigns with them that I’d be happy to fund their campaigning infrastructure, they gave me an opportunity to pay towards saving the NHS, something they knew I really cared about. And they didn’t simply assume that because I had taken part in an NHS campaign through 38 Degrees, that I was ready to jump straight to an unrestricted direct debit. 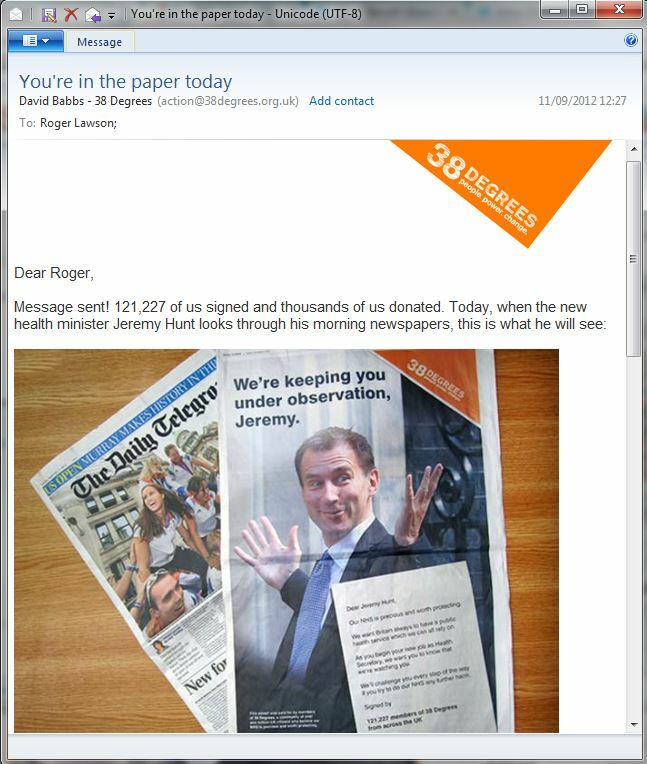 They realised that the thing I cared about was the NHS, not 38 Degrees. And because of that they got my money, they developed my ‘supporter journey’ and, at the same time, they increased my commitment to the organisation. This time last week I sat riveted in front of the live-stream of Greenpeace’s IceClimb. Much has been written about what a fantastic campaign it was. And it certainly was. The Shard is the tallest building in Western Europe and had never been climbed, guaranteeing coverage. It was also designed and named after a shard of ice and sits right in the middle of Shell’s London offices – so perfect for Greenpeace’s core message of the need to protect the Arctic from Shell. It captured the news around the world and it captivated individuals like me. At its peak, 13,000 people were viewing the live stream; over 65,000 signed to show their support; an estimated 3 million people engaged with it through social media. And I was one of them. I watched the live-stream for hours, on my laptop and even on my phone as I walked the kids to school. I signed the list to show my support, I tweeted about it and I told people that I spoke to. I got no work done! It was, I believe, Greenpeace’s best campaign in many years. In fact, maybe the best campaign anyone has done in many years! To be honest, I haven’t given it much thought since then. I’ve been working in London, preparing for a big workshop yesterday, I’ve been running the kids to tennis, cricket, cubs, scouts, guides etc, I’ve been out with friends and much more. A typical week, and the IceClimb hasn’t been my highest priority. It was a moment in time that, for me, has been overtaken by many more moments. But that’s the point isn’t it? The challenge Greenpeace, and others, have is to keep me and everyone else engaged – with the issue and with the organisation. To turn that moment when I am completely connected to Greenpeace into long term support and long term value. And on that score, Greenpeace has failed miserably. Greenpeace has my postal address, but I haven’t received anything through the post. They have my mobile number but I haven’t had a text since last Friday morning (by which time I’d already been watching it for nearly two hours). And no phone call at all. They have my email address from when I signed up last Friday (and opted in to communications) but I haven’t had an email (apart from the one confirming my sign-up). They know that I’ve tweeted about them, but nothing there either. Last week I was really warm – I’d have said yes to anything they asked. Today… well I’m a bit warmer than I was before the IceClimb, but not much. Life has moved on. Many of you will know that I am passionate about how charities integrate their fundraising and their campaigning and that I’ve written about this, spoken about it and worked with many organisations to achieve it. So I am frustrated that Greenpeace, who really should be the best of the best at this, can get it so wrong and miss this amazing opportunity. A simple supporter journey that updated me on the six climbers since their arrest, on Shell’s attitudes since the campaign or on the other work that Greenpeace is doing to protect the Arctic would have maintained my interest and my enthusiasm. And a simple ask for money to support more of their work in the Arctic (Greenpeace has great fundraising asks related to the IceClimb – from becoming a ‘Life Supporter’ to save the Arctic to helping buy a Survival Pod to stop the drilling) could not have failed. Instead nothing. Even the website hasn’t been updated with the latest news having been posted before the IceClimb and not even a mention of it on Greenpeace’s ‘Save the Arctic’ pages. What a waste. Yes I’ll continue to support Greenpeace, and I’ll feel a bit better about it after last week than before. But I’m sorry guys, you missed a real chance last week. PS Come back next week and I’ll blog about two organisations that I think have done this really well in recent years.